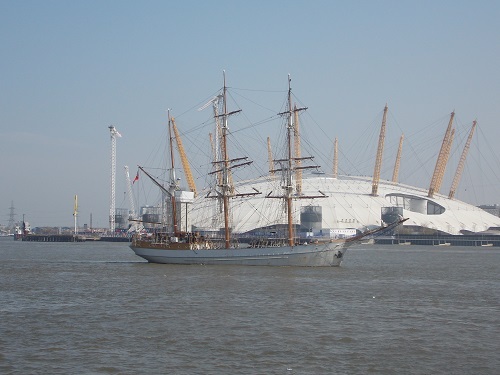 After a quiet period for visitors to West India Dock , we welcome the Tall Ship Kaskelot , a three-masted barque and one of the largest remaining wooden ships in commission. Kaskelot has quite an unusual background being built in 1948 by J Ring Anderson for the Royal Greenland Trading Company at the Svendborg shipyard in Denmark . Originally she was used to take supplies to remote coastal settlements in Greenland, she then was used as a fisheries ship in the Faroes. 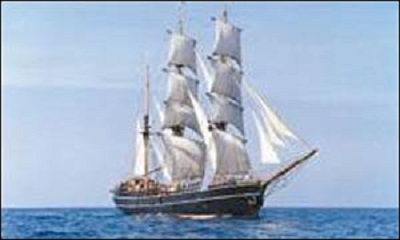 In the 1980s she was bought by a film production company and she become a bit of a film star appearing in a number of films and television programmes including The Last Place on Earth (1985), Revolution (1985), Return to Treasure Island (1986), The Three Musketeers (1993), Cutthroat Island (1995), Swept from the Sea (1997), A Respectable Trade (1998), David Copperfield (1999), Longitude (2000), Shackleton (2002) and Amazing Grace (2006). 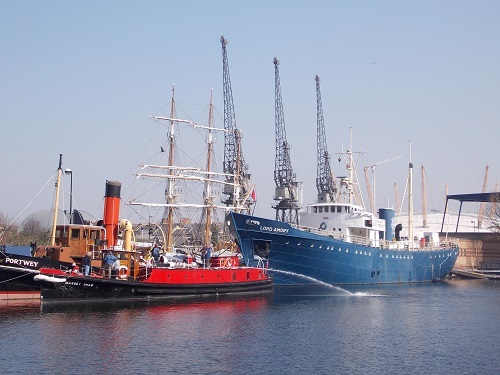 In 2013 she was sold and has just completed a major multi-million pound restoration at T. Nielsen in Gloucester where many original features were retained whilst incorporating state-of-the-art equipment and machinery. 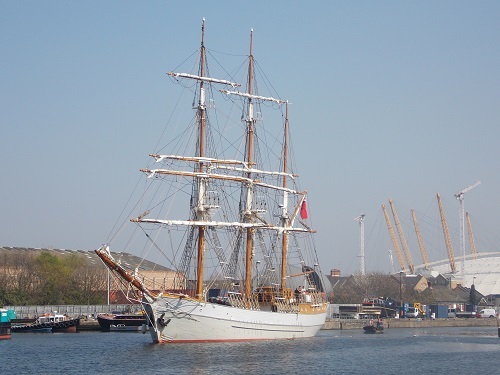 It is thought the owners are going to use the ship for charters, filming and private events. 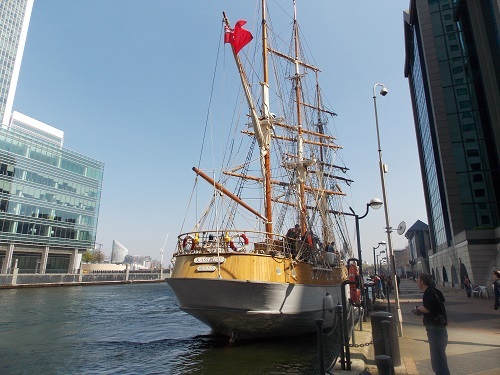 although if you fancy buying a large Tall Ship the ship is available to purchase. William Heath Robinson was a cartoonist and illustrator best known for drawings of ridiculously complicated machines. Even today, the term ‘Heath Robinson’ is used by many to describe a complex complicated machine that is constructed from everyday items. However , he had a brother Thomas who was also a talented cartoonist and illustrator and was known for his book and magazine illustrations, and it was looking through a Strand magazine of 1905 when I came across these illustrations. 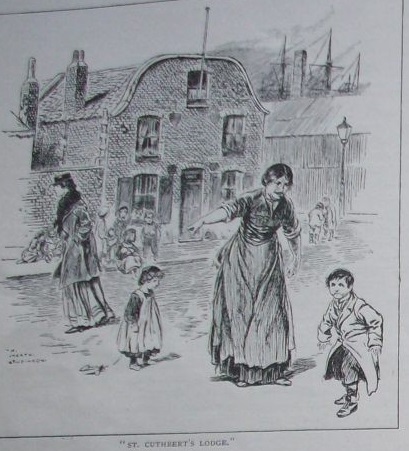 The article it illustrated was “”Off the track in London” by George R. Sims which I have featured before, but the illustrations bring some of the article to life. 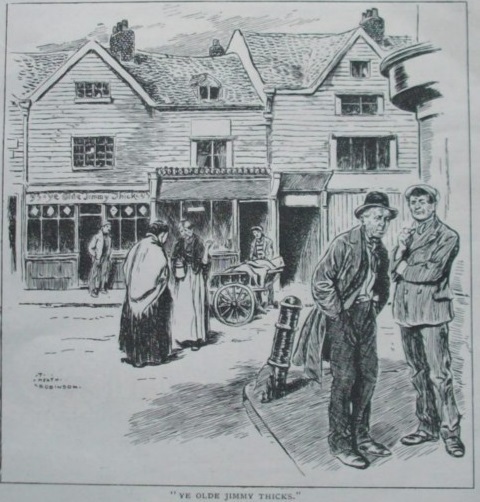 The first illustration is ” Ye Olde Jimmy Thicks ” which was apparently an eating place in Three Colt Street, Limehouse, the article gives us a little more information. 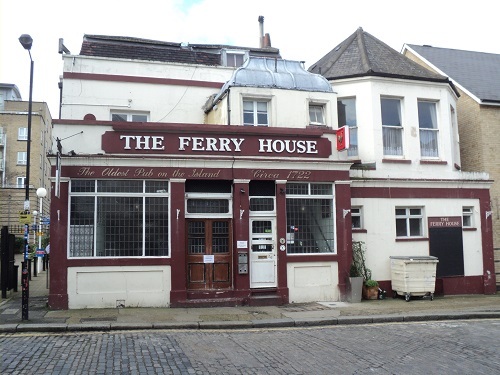 At the end of the Causeway are a few two-storey houses built into railway arches. The trains run over the top-floor ceiling. Outside they are peaceful-looking dwellings. How much peace there can be on the top floor when an express or a heavy goods train passes over them one can only conjecture. Leaving these quaint specimens of architecture on the right, we wander in and out of a network of narrow by-ways and quaint old-world thoroughfares to find ourselves presently in Three Colt Street. 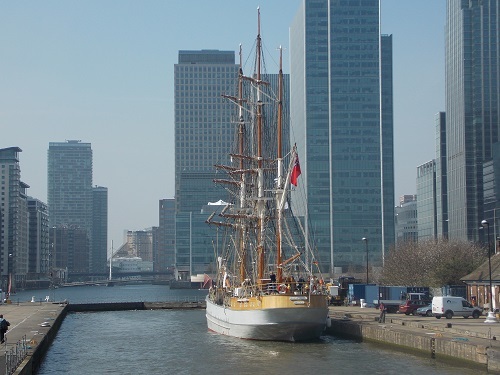 We have left Oriental Limehouse behind us. Here the environment is typical of the old-fashioned Cockney district with a strong leaven of the Irish element. Here are plenty of public-houses well filled, and here are the local gentlemen who loll against the wall and the local ladies who gossip at street corners, basket or bag on arm and latchkey on forefinger. Three Colt Street is a shopping neighbourhood, and one in which the shoppers take the middle of the road, for here are stalls and barrows with comestibles to suit the purse of the humble housewife whose allowance from her lord and master compels her to buy in the cheapest market. Half-way down the street is a block of old-fashioned wooden houses, which are in curious contrast to the up-to-date bustle of the inhabitants. The hat is given that the party in the brake may all be similarly headgeared. It is a light white sun hat, suggestive of a song and dance in the cotton fields. That you may see yourself in one before you start, a photograph of the company in a former excursion, all in the ‘included hat,’ is also exhibited in the tavern window. 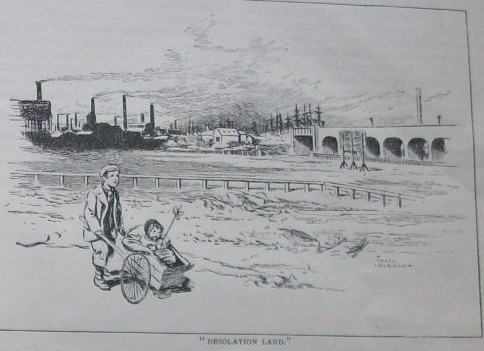 The second illustration ” Desolation Land” offers a view from what is now Mudchute Park and Farm looking towards the Viaduct that is now in Millwall Park. George Sims surveys the waste land and wonders if it could not be used for better purposes, which is of course what happened with the creation of Millwall Park and Mudchute Park and Farm. In the centre of the island lies Desolation-Land, a vast expanse of dismal waste ground and grey rubbish heaps. All round the open space is a black fringe of grim wharves and of towering chimneys, belching volumes of smoke into a lowering sky that seems to have absorbed a good deal of the industrial atmosphere. This waste land is spanned by the soot-dripping arches of the railway, which is the one note of hope in the depressing picture, for occasionally a train dashes shrieking by towards a brighter bourne. Across the waste, as we gaze wearily around it, borne down by our environment, comes a lonely little lad, who wheels his baby sister in a perambulator roughly constructed out of a sugar box. They are the only human beings in sight. Years ago this desolate spot was farm land. It might yet be secured and made into a green play ground for the children, who at present have only the roads and the miniature mountains of rubbish that have gradually risen at the end of side streets closed in by factory walls. If this central desert could be secured and ‘humanised’ and turned into a healthy playground, it would be a grand thing for the Millwall that is – a grander still for the Millwall that is to be. The third illustration is named ” St Cuthbert’s Lodge ” which regular readers of the blog will know was the home of the Reverend Free whose book Seven Years Hard has been featured on the site. 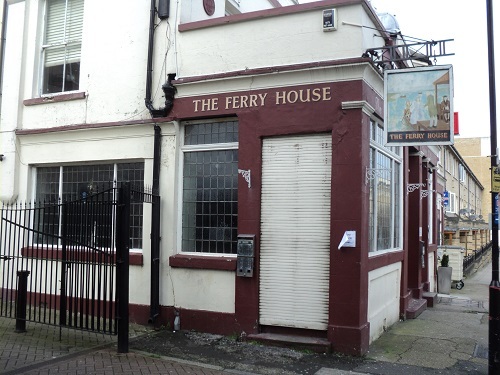 In Ingleheim Street, a turning off West Ferry Road, there is a quaint brick building that at once attracts your attention, for above it is a flagstaff, and in the wire-protected windows there are flowers. When you go down over the rough bit of roadway that ends in a wall of corrugated iron and a suggestion of black sheds beyond you read above the doorway of the quaint building the words, ‘St. Cuthbert’s Lodge,’ and you remember that this is the address of the Rev. Richard Free, the author of that intensely human document, ‘Seven Years’ Hard,’ the story of seven years’ patient, and often heart-breaking, work among the poorest population of a land of drudgery and desolation. When we came first upon St. Cuthbert’s Lodge, not knowing what it was, the oddness of the building struck both my colleague and myself. The suggestion it conveyed to my mind was that of a lifeboat station or ark of refuge on a lonely shore. Why it conveyed that impression I cannot say. I am inclined to imagine that somewhere on the Yarmouth shore I have, in years gone by, seen something like it. 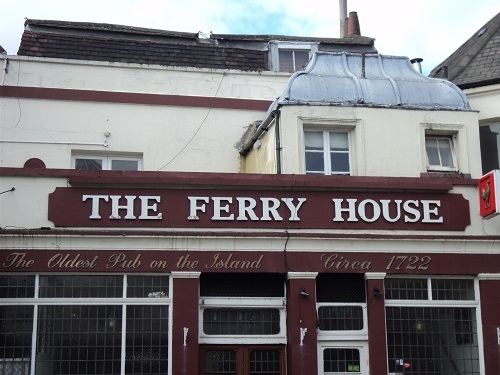 A veritable ark of refuge has this quaint little building – with the ship masts stretching high above it – proved to many in Millwall. Mr Free and his wife, cut off from the world, with which their one link is the little, conductorless one-horse ‘bus, have brought the love of light and colour into houses of grimness and gloom, and, taking the human view of our poor humanity, have become popular characters in the island of mighty tasks and mean surroundings, of noxious trades and pleasureless lives, an island in which there are no places of amusement of any kind. Anyone reading Mr Free’s book would know that his stay in Millwall was not quite that easy and Millwall was not quite as grim as George Sims suggests. 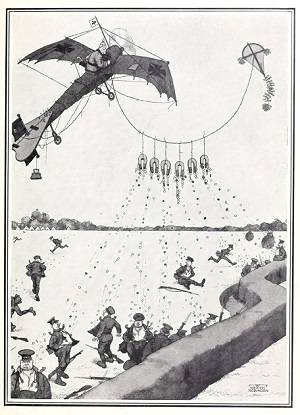 Thomas’ younger brother William Heath Robinson produced a series of humorous sketches in the First World War which showed his trademark sense of humour. After the First World War his designs become even more complex and were used in books and advertisements. He died in 1944 but his designs are still popular and there is a move to build a Heath Robinson museum in Pinner where he spent most of his adult life. Update : The William Heath Robinson Museum is due to open in October 2016 and an exhibition that will feature the work of both of the brothers will open in 2017. Many thanks to Peter Higginson of the William Heath Robinson Trust for the latest updates. Although I love living in the city, now and then I feel the need for a walk in the countryside. Well fortunately I don’t have to go very far , because if I want to enjoy nature I take short walk down the middle of the Isle of Dogs to Mudchute Park and Farm. 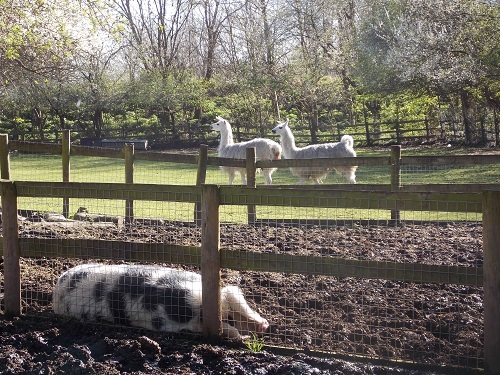 It is one of the largest inner City Farms anywhere in Europe, with a wonderful collection of over 100 animals and fowl on the farm. 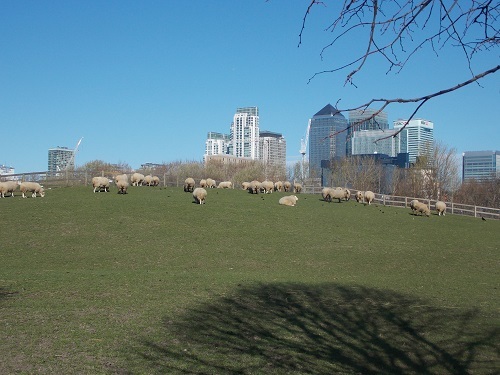 In a previous post I went into the history of the Park and farm and showed it owes its existence in some ways to the mud dug out of Millwall Dock. 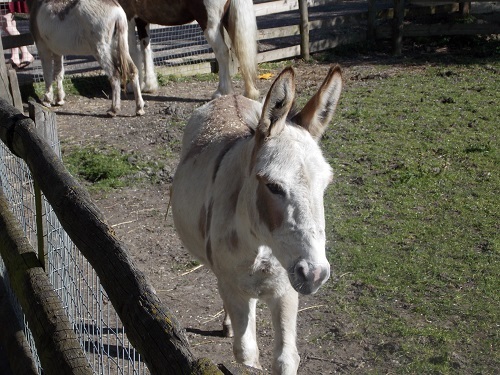 On a warm spring day ,the farm is alive with visitors especially families who enjoy all the animals on show. 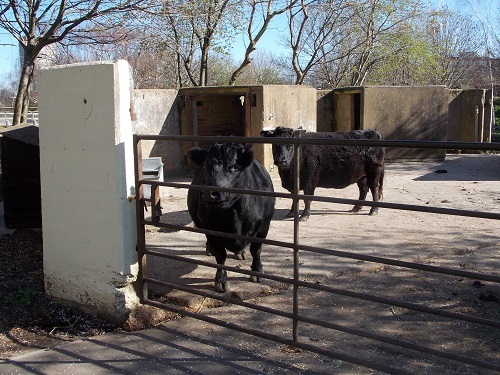 There is a number of rare breeds on the farm including Dexter cattle and a Gloucestershire Old Spot pig. The Farm has just planted a community orchard in partnership with the London Orchard Project and local schools. 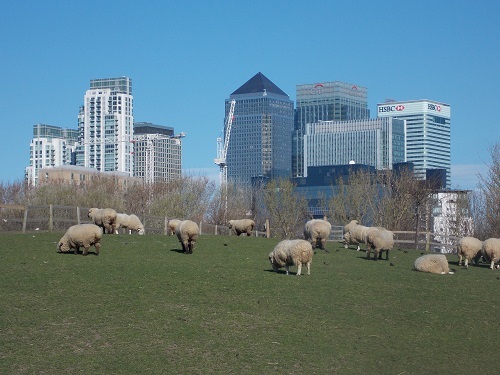 When you are wandering around the farm it is hard to believe you are less than a mile from the skyscrapers of Canary Wharf. Run almost entirely by local volunteers, it is the Island’s hidden treasure. It is not just the animals there is always lots of events organised for adults and children. If you feel the need for a rural retreat, head down to the farm and even sample the homemade meals at the Farm café. 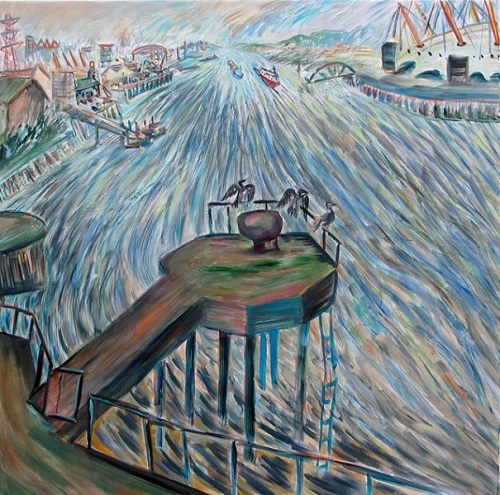 Last year I posted an article about the Mural being created celebrating the SS Robin and the Royal Docks, the artist in charge of this community scheme was Frank Creber . 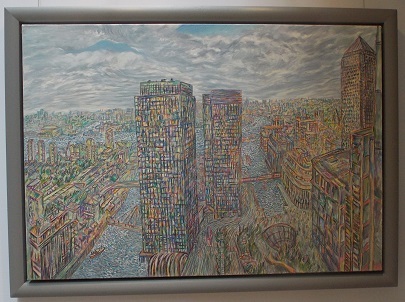 Yesterday I went to Frank’s new exhibition at the Gallery within the Lloyd’s Register building at 71 Fenchurch Street, EC3M 4BS. Although now housed in an ultra modern Richard Rogers designed building, Lloyd’s Register has a long and distinguished history providing quality assurance and classification for Merchant Shipping. 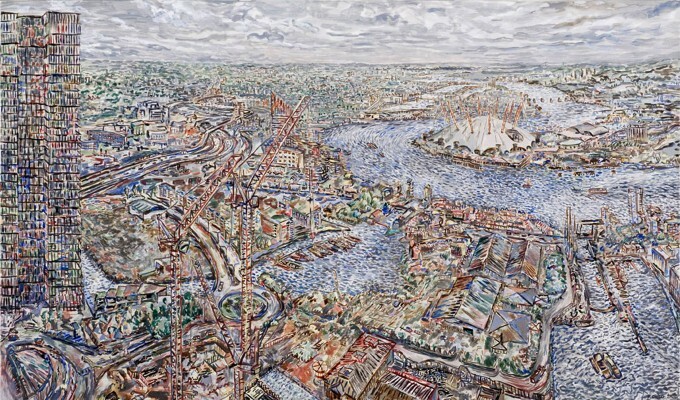 Therefore it is an appropriate setting for Frank’s paintings which pays homage to the traditions of the East End and Docklands areas but is also about the present and the future. 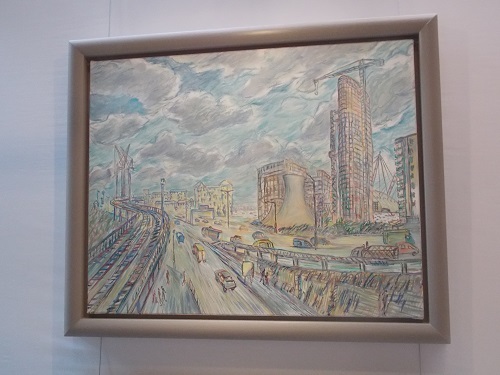 The Exhibition covers a wide range of Frank’s work including pieces created for the Water City project and work undertaken when he was one of the leading artists of the Bromley by Bow Centre. Frank has been part of the Water City programme for a number of years as the official artist in residence in 2004 to being the Director of Visual Arts for the Water City Festival in 2009. 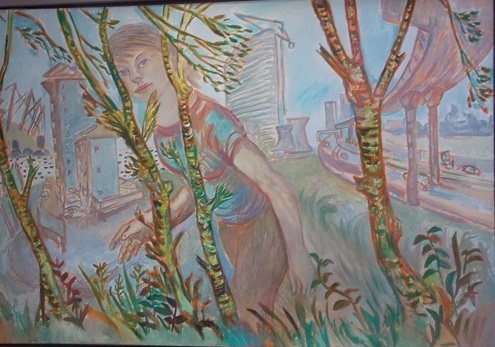 Frank’s pictures are interesting mix of landscapes and figures in an ever changing kaleidoscope of colour, often he places individuals and communities at the heart of his pictures to reflect it is usually local people and communities who pay the cost of rapid urban change. 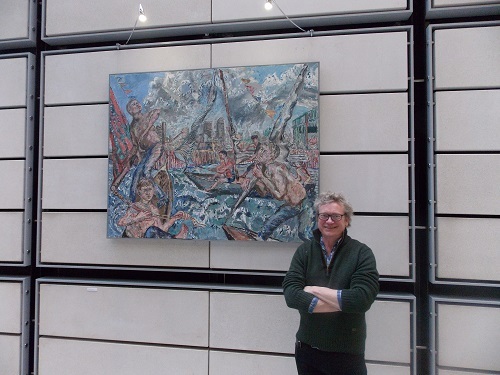 Frank will be at the gallery on selected days when the exhibition is running, he will available to discuss the paintings and give information about other forthcoming Water City events. This exhibition is linked thematically to the Water City exhibition ‘ Walking on Water ‘ that is due place at ExCel in May in partnership with Grand Designs Live. 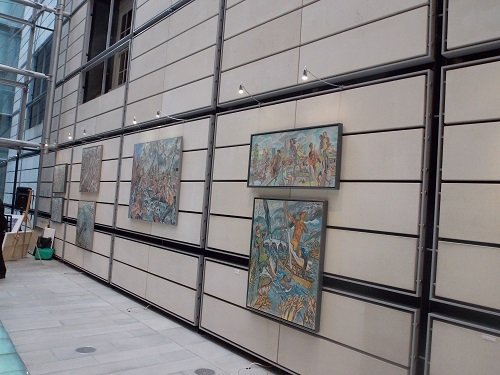 Lloyd’s Register is developing the Gallery space which is situated next to the reception to include more exhibitions, it is well worth a visit to see Frank’s exhibition but also the Richard Rogers designed building. 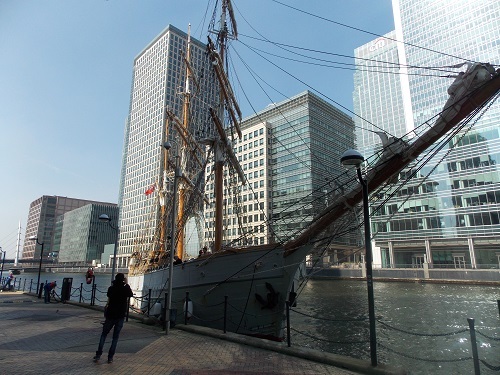 For the maritime minded, Lloyd’s Register have a Information Centre Library and Archive that provides access to the full collection of the Lloyd’s Register of Ships (1764 to date) and assorted other publications. Last week the Isle of Dogs and Canary Wharf in particular were over a couple of days shrouded in fog for a few hours in the morning before the sun burst through. 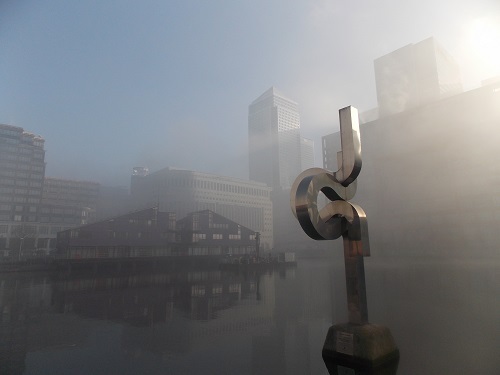 These fogs are not unusual in the Isle of Dogs due to its proximity to the river and it’s low-lying terrain. Although these fogs often cause minor delays for the river traffic, the disruption is generally minimal. 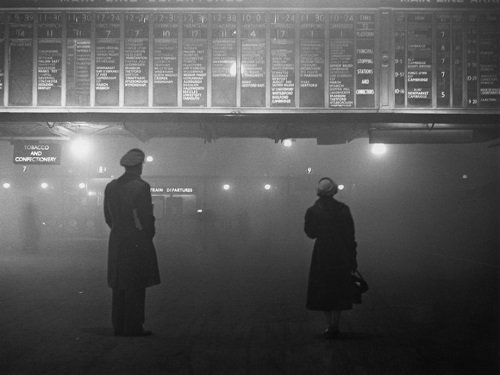 However if we go back just over 50 years and beyond, London fogs or London particulars as they were known not only caused widespread disruption but were responsible for a large number of deaths. London’s wealth was often built on the wide range of manufacturing taking place in the city, little thought was given to the effect of the pollution going into the river or the pollution billowing out of the thousands of chimneys into the atmosphere. By the late 19th century the effects of this pollution was most obvious in the winter months when it combined with dank and damp weather conditions, the following newspaper report from the Daily News of 1888 illustrates some of the problems. Do you know what a real London November fog is? Having gone through an exceptionally trying ordeal of the mixture during the most dismal and melancholy month of the a calendar, I fancy that I am qualified to describe the phenomenon. The pea soup fogs of the metropolis, which are unique, and are really coal, in solution, which falls in the form of smoke and sooty particles upon the lower strata of the atmosphere when there is not sufficient circulation of air to carry these matters off. A high barometer, the sign of the stillness in the aerial regions which allows all the discharges from the million chimneys of London time to condense upon the cold, watery particles of the atmosphere, and afterwards to descend in this amalgamated condition upon our devoted selves. we are enshrouded in a thick fall of fog, dense in consistency, bilious brown and yellow in colour, and pungent and sour to the taste. During the worst of it a more than midnight darkness broods over the scene; all traffic in the river is stopped, cabbies lead their horses, and gas-lamps in the street and in the offices make a feeble kind of protest against the tyranny of King Fog, electric lights are no good at all, and throw a sickly uncertain illumination on the ghastly picture. 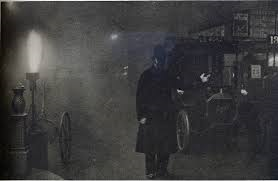 The moral effect is most deplorable; with everything wrapped within this dreadful sheath of foul fog, and everybody stealing about like ghosts, a sense of depressing unreality seizes on one, there can be no doubt but that the London fogs kill many people, with delicate throats and chests, and injure large numbers. After a day’s battle with a bad fog, you return to your suburban retreat covered with filth; collar and cuffs turned from white to brown, and the face and hands in need of the scrubbing’ brush; the nostrils, lined with soot, indicate the extent to which the lungs are affected. It is a mystery to me why Londoners do not insist that this fog matter shall be made a Parliamentary question. The loss to trade through delays and accidents is very considerable, and injuries and inconvenience to the five million inhabitants of the metropolis and its population are incalculable. The simple answer why parliament did very little about the problem was that economic prosperity was valued over environmental problems which may only be really disruptive for a few days per year. 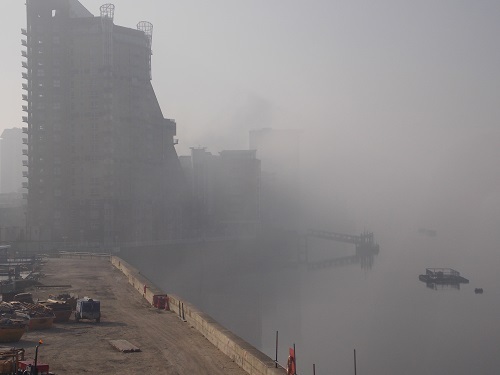 The Docks and the River were dangerous places to work even when conditions were good, when heavy fog descended there was often fatalities as indicated by the following reports. The dense fog which has been prevailed in London for several days past is still extremely severe, and is causing great inconvenience , no fewer than 23 persons have been drowned at the docks by falling into the water. 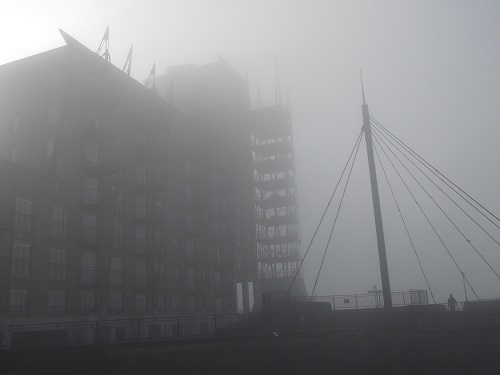 The dense fog which settled over London and the neighbouring districts last Saturday still continues. Many accidents have been reported, including the drowning of fourteen dock workers at the London Docks. 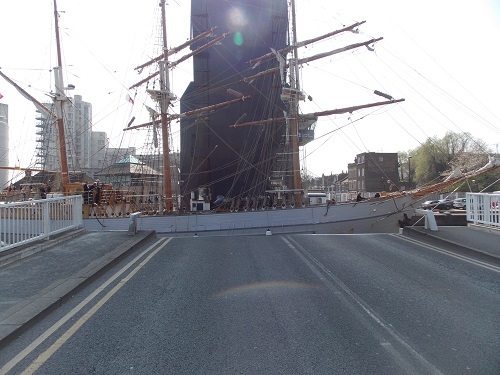 LONDON, Monday.—Six ships- collided in a dense fog, near the West India docks on Saturday night, one of which sunk and the crew narrowly escaped. 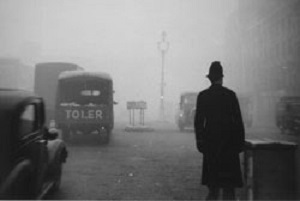 Towards the end of the Second World War up to the early 50s , there were a series of cold winters that produced a large number of foggy days which culminated in the Great Smog of 1952 which turned what was seen as an occasional inconvenience into a National Disaster. There was a number of factors that contributed to the Great Smog of 1952, the November and early December was very cold with heavy snowfalls, this led to people burning large quantities of coal which created a large amount of smoke. Weather conditions rather than dispersing the smoke, trapped it above London with the pollution from the factory chimneys. On the 5th December, the fog developed and large amounts of impurities were released into the atmosphere, over the day the fog thickened to such an extent that in many parts of London drivers and pedestrians found it impossible to see even a few yards away. It was said on the Isle of Dogs the fog was so thick that people could not see their feet. Over the next three days the fog continued and a large number of people began to suffer breathing problems and hospitals began to be under pressure to cope with the demand. When the fog finally cleared on the 9th December, it was estimated 4,000 people had died has a result of the fog. Many thousands more suffered from bronchial problems, it was even said that cattle had choked to death at Smithfield Market. In the weeks after the smog an even grimmer picture began to develop, as the following news report suggests. 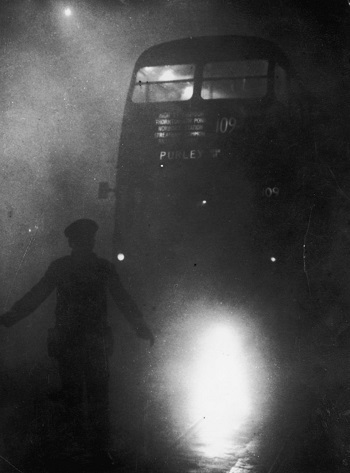 LONDON,, Fri. — London’s “great smog ” disaster in 1952 took 12,000 lives, not 4000 Dr Ernest Wilkins,- head of the atmospheric pollution section of the Scientific and Industrial Section told the Royal Sanitary Institute in London. He said that 4000 Londoners died during or immediately. after the smog, but 8000 more died in January and February 1953, and these had to be added to the total of the victims. One of the main causes for the distress was the high levels of sulphur dioxide which a later report points out. LONDON FOG WAS POISONOUS LONDON. 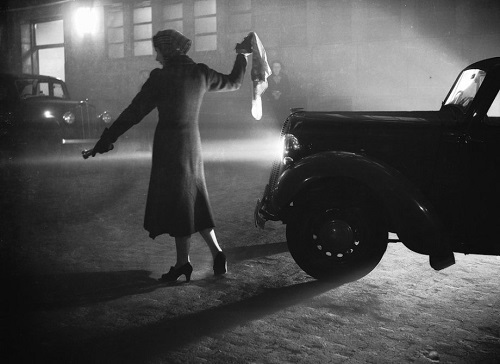 The fog which blanketed London a fortnight ago was seven times more poisonous than ordinary fog, and contained corrosive sulphur fumes in never before recorded strength. Eventually politicians and the government were forced to act which eventually led to Clean Air Act 1956 which banned the use of coal for domestic fires in urban areas and moving power stations out of cities. These measures did take time to have effect but eventually real progress was made and the Great Smogs became a distant memory. It didn’t mean the end of pollution however, with car fumes then becoming the main source of concern . Last year I wrote a post about John Arthur Trudgen, a local hero who although virtually unknown now, in his day he was a champion swimmer and had a stroke named after him. Recently I came across another 19th century sporting local hero who found fame here and around the world. Frank Scurry Hewitt was born in Ireland, but later lived and worked in Millwall, when he began his athletic career he was known as Frank Hewitt from Millwall. When he was an old man he told a newspaper about his origins. 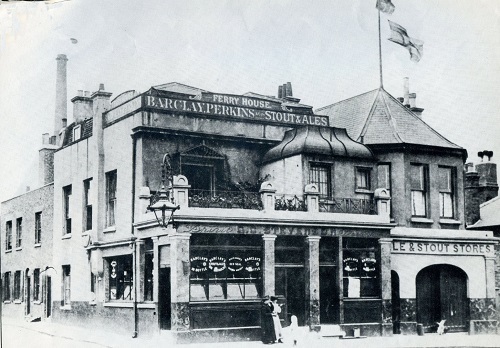 It was in 1863 I ran my first race at Bow running grounds, England, for £5 aside, 440 yards. The old Sporting Life was stakeholder and referee. They paid me all in sovereigns. I had never had so much money in my possession. I wrapped it up in my handkerchief, and was very frightened till I got safely back to Millwall. I gave it to my mate, who backed me and gave me half of the stake. I was then working on the wonderful iron ram Northumberland, and great people came from all parts of the world to look at her. She then was the wonder of the world — only had to get steam! up, ram the other fellow, and that was the end of it. ‘My father’s regiment, Her Majesty’s 24th Green’s, was stationed in Dublin Barracks. My mother, a beautiful woman, could speak seven different languages. They lived in Limerick, in George-street, where I was born on May 8, 1845. My father was Major Francis Scurry — that is my name. As I entered in Sheffield handicaps as Frank Hewitt, I have always been called Hewitt. Amateur Athletics of the time was dominated by runners with independent wealth or those who were backed by rich patrons, for others the only way to make a living in running or ‘Pedestrianism’ as it was known was to run in matches against other runners for a cash purse. This is how Frank Scurry Hewitt of Millwall made his name by winning a number of races all over England, the Sportsman magazine gives a list of his more notable races. 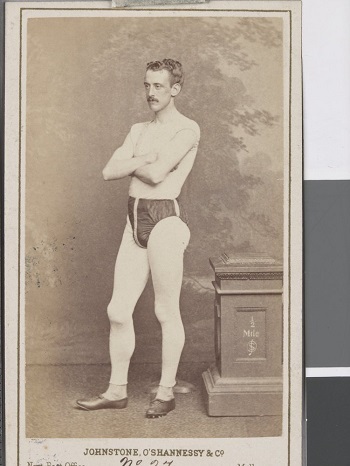 Frank Hewitt of Millwall is the best all round’ man the English foot racing arena has possessed for some years,, was born on May 8, 1845, and stands 5ft 8 in. 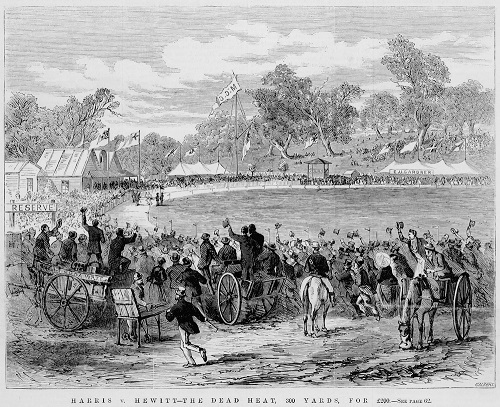 in height His first appearance in the pedestrian arena was in 1863, with Springhall, of London, a quarter of a mile, for £5 a side, at the Bow Running Grounds, Hewitt winning easily. Smith was next pitted against him, at the same enclosure, the latter allowing his opponent 10 yards start in 440, for £10 a-side. when Hewitt was again successful, Hawkins then , opposed Hewitt, the same distance as the previous matches, for £10 a-side ; the men met on the Chatham and Maidstone-road, when Hewitt was again victorious. A silver challenge cup way given to be competed for at Greenwich, which was also won by Hewitt, beating a field of 15 others. In 1866 he went to Sheffield, and succeeded in carrying off a £40 handicap. The Marquis of Queensberry and other noblemen and gentlemen having promoted a 150 yards and a quarter of a mile handicaps at the Crystal Palace, Hewitt was one of the men who entered. In the 150 yards race he was defeated by W. Brown, of Manchester (to whom he gave a yard and a half), by a foot He, however, won the 440 yards handicap by five yards, taking the first prize, £25. He next received £10 forfeit from J. Heeley, .of Lowerhouses, who was matched to run him 250 yards. He also received £2 of Cobbler Wood, from Sheffield, for their match, distance 150 yards. They were afterwards matched for £25 a-side to run the same distance, and the race took place at Hyde park, Sheffield, and was witnessed by upwards of 6,000 spectators. The result was never in doubt, Hewitt winning easily by four yards. Rothwell of Bury, then matched himself with Hewitt to run 440 yards for £25 a-side, and they met at the Royal Oak-park Grounds, Manchester. Odds of 3 to 1 were laid on Hewitt, who won by a yard. He next competed in Mr Cooper’s quarter of a mile sweepstakes of £5 each, eight of the quickest men in England contesting. Fortune again favoured Hewitt, for he won in a most masterly style, and took the first prize £4o, and a splendid silver cup, given by the promoter ; Hayward, of Rochdale, was second ; and Mole, of Walsall, third. In September, 1867, he ran J. Nuttall, of Manchester, 440 yards, for £25 a-side, at Hyde-park, Sheffield, Nuttall allowing his opponent four yards start. Hewitt won easily. In April, 1868, he won the first prize in a mile handicap sweep stakes of £5 each, at Manchester, to which was added by Mr Cooper, a silver challenge cup, value 60gs. and £30 in money, Hewitt defeating Albert Bird, who received 15 yards start; R. Hindle, of Paisley; and McInstray, of Glasgow, after an exciting struggle, by a foot, in 4m. 21s. He shortly afterwards ran second to R. Buttery, of Sheffield, in an 800 yards handicap, for which £100 was given by Mr Cooper, at the Royal Oak Park grounds, Manchester. On August 17, last year, he beat J. Ridley, of Gateshead, on handicap terms, distance 880 yards, for £50 a-side, at Hyde-park, Hewitt having 12 yards start, and his opponent 25 yards start. 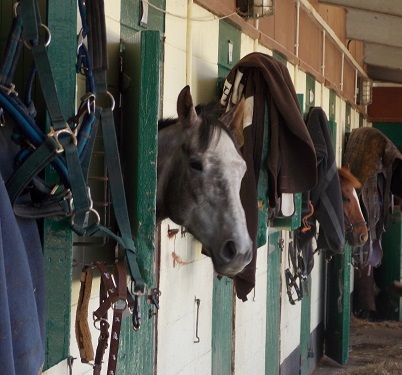 The betting was in favour of Hewitt at 5 to 4, a huge amount of money changing hands, and he won a most exciting race by three yards; time, lm. 54s. 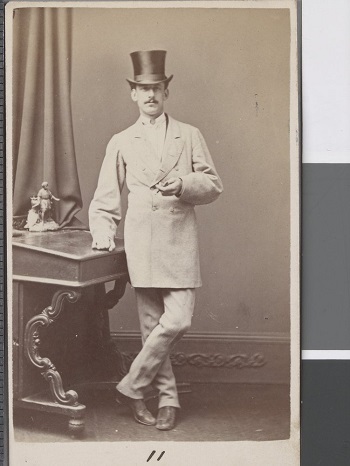 In 1869 Frank Hewitt with a few other English pedestrians travelled to Australia and New Zealand and successfully beat many of the local pedestrians. 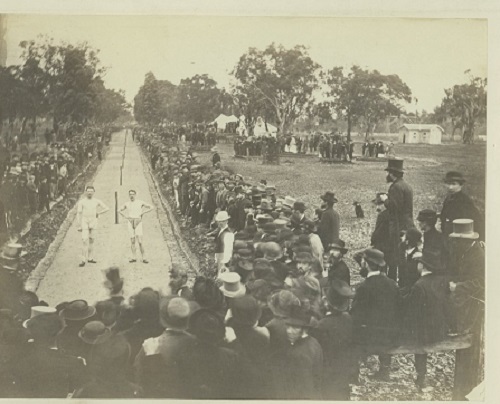 One of his most famous series of races was against local champion J. G. Harris at what became the Melbourne Cricket ground in front of a crowd estimated at 20,000. A local newspaper gives the results. One of his principal races is that colony was with Harris. At 100 yards Hewitt won, at 200 yards Harris won, at 300 yards there was a dead heat, and at 440 yards Hewitt won easily. The run-off of 300 yards, for £200 a-side, was won by Hewitt. After this great success, Hewitt stayed in Australia and became a great favourite amongst the pedestrian fans. He carried on running and winning races into his forties, and was well respected for his opinion on Athletics in his later life. Frank Hewitt, one of the greatest footrunners Australia has ever known, died here to-day. Fifty-seven years ago Hewitt came to Australia from England, with two other pedestrians. Bird and Topley. He began his Australian career at Melbourne in 1870 where he ran a match on the Melbourne Cricket Ground, against J. G. Harris over 100, 200, 300 and 440 yards. They were wonderful contests. Hewitt won the 100 yards by a foot, the 300 yards was a dead-heat, Harris won the 200 yards, and Hewitt easily won the 440 yards event. At the time of his death the old champion was 81. Although timings were difficult to confirm , Hewitt is credited with running 100 yards in just under 10 secs, 142yds in 13 sec, 300yds in 30sec, 400yds in 43sec. and 880yds in 1 min 53sec. It was widely reported that he broke the Half Mile world record in Christchurch, New Zealand in the time of 1 min 53.1 secs. There is no doubt that he was one of the most famous pedestrians in the world before the Olympic movement started and excelled over a wide range of distance from 50 yards to a mile, in his long career in Australia, he never forgot his Millwall connections by always insisting that he was to known as Frank Hewitt of Millwall.